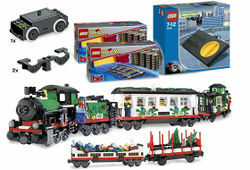 K10173 Complete Holiday Train Collection is a Trains product collection set released in 2006. Included are five sets, two of which were the same, giving the set 997 pieces in total. Facts about "K10173 Complete Holiday Train Collection"
This page was last edited on 12 January 2016, at 23:01.